Poufs are made from PUR foam rubber and the cover can be full colour printed with your personal design! Very nice to decorate your office, home, shop or even on business fairs. For the delivery of your cube shaped seats we use multiple carriers. Because of the highest reliability, in most cases we use UPS or DPD. The cube shaped seats that is chosen in most cases can be selected via our website. Only the cover is suitable for washing. Find yourself hunched over your desk far too often? Improve your posture with Helloprint's Cube Footstools! Available in multiple shapes and sizes, add a comfy twist to the workplace with this chair alternative. If you'd rather they be Ottomans, that works too; either way they'll always look their best with your printed logo! Prefer to have your fun outside? Not to worry, we also offer a water resistant version that's ideal for outdoor events and garden decoration. Their convenient shape means easy storage, so there are definitely more pros than cons with this quality product. 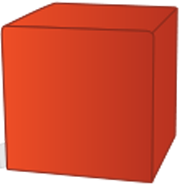 The cubes have a core of foam rubber. The core will shipped in a vacuum sealed packaging, which will be approximately 15-20% of the original product size.